A £20.00 deposit is required to secure your booking, which is then deducted from your hire charge. The balance, if more convenient to you is payable upon your arrival at the caravan, but please note we do not accept debit or credit cards, sorry. If you cancel your holiday in my caravan,and I can-not re-let the caravan for the dates you were booked into the caravan, you will be responsible for the FULL amount, and you will forfeit your deposit, for admin fees. Please indicate how many guests would be occupying the caravan, thank-you. Newholm Green caravan park is set at the end of a secluded cul-de-sac in the beautiful hamlet of Newholm which boasts an 'olde worlde inn' 'The Beehive Inn'. Newholm Green caravan park is in the North Yorkshire Moors National Park, with beautiful country side surrounding the park. 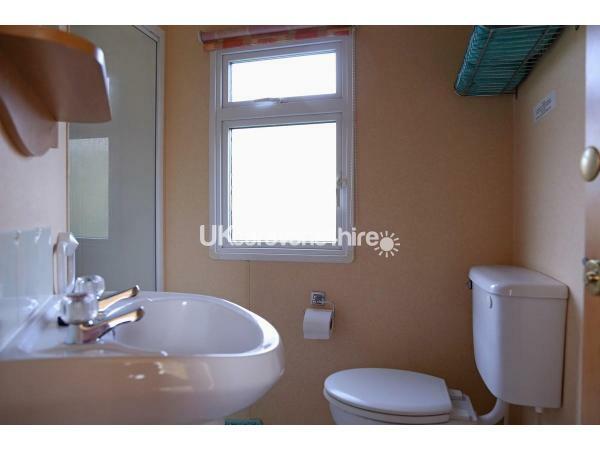 The caravan is a lovely 6 berth caravan with 2 bedrooms and a pull out double bed in the lounge area. (Sleeping a maximum of 6 guests) The lounge has comfortable seating with a gas fire, which adds to the cosy feel on chilly evenings. In the lounge there is a flat screen TV, freesat, DVD player, radio /CD player. 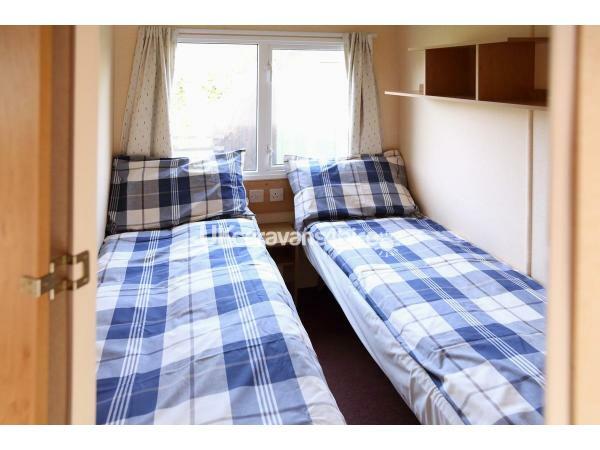 The double bedroom has fitted wardrobes, storage space, carpeted throughout; the twin bedded room also has fitted wardrobe and storage space, again carpeted out. There is a compact shower room with full facilities. Parking is by the caravan, with ample space for more than one car. I have tried to supply everything you will need to make your life that bit easier whilst you are on holiday. The large grassy area within Newholm Green caravan park is ideal for just relaxing in, or for children to play in. We are only 3 quarters of a mile away from the park & ride, therefore making it easy to get into the centre of Whitby. Information on local amenities are supplied in the caravan to assist you in making your holiday a happy & successful one. Whitby is 'The Jewel of The coast'. Whitby has the famous 199 steps leading up to the Abbey, freshly oak smoked kippers, 'Dracula experience',as well as beautiful woodland walks, from a few hours to a full day, more challenging is the famous Coast to Coast, the Lyke wake walk and the Cleveland way. There is good surfing & bathing in the sea @ Whitby, Sandsend & Staithes, & acres of rock pools to investigate all along the coast. Excellent fishing is available, either from the shore or sea-angling. A welcome pack awaits you in the caravan at Newholm Green, (tea coffee sugar and milk). All bedding, bedlinen, and towels, as well as gas & electricity are included in your holiday price. The beds are all made up for your arrival. The kitchen is well equipped with fridge (with ice box) microwave, kettle, toaster, iron and ironing board, vacuum cleaner, full size cooker with grill and 4-ring hob. All matching crockery, cutlery, pans etc are supplied as well as outdoor seating and a rotary clothes line. All breakages to be paid for. I do have some mid-week, week-end breaks available, please contact me for details. SORRY - NO SMOKING, OR PETS IN THE CARAVAN. I am constantly improving the caravan therefore the exterior/interior may vary slightly from the picture, but only to your advantage.